Greta Thunberg, the 16-year-old girl from Sweden who started the Fridays for Future (F4F) movement, mingled with some 25,000 protesters in Berlin on Friday. Participants cheered when they saw her leading the protest march in the morning, along with mostly young German activists. Linus, one of the organizers said Greta was not the leader, but the initiator of F4F and a role model. It was a good feeling to show the struggle for the conservation of the environment was a unified endeavor, he told The Berlin Spectator. Jonas, another secondary school student, stated he believed some of today’s participants did come to see Greta. But a more important aspect was the fact that the F4F movement was growing by the week. Two weeks ago, 15,000 joined the Friday protest. This time, 25,000 came. “It is a good sign Greta is here, supporting us”, Hannah said, a teenage girl who has been part of F4F for several weeks. She said there were kids who thought Greta was cool and who were motivated by her participation. Adults joined the protest as well. Dr. Barbara Höfner of the organization Doctors for Future said it was important to support the youth movement because the environmental problems in the world did affect people’s health. At the protest’s starting point and at the closing rally in front of Brandenburg Gate, young F4F activists from France, Denmark, Belgium, Switzerland and other European countries spoke about the need to save the environment now. After a long march through Berlin’s city center, the protesters listened to music and countless speeches at Brandenburg Gate, before Greta Thunberg finally hit the stage. “We should worry. We should panic”, she told the crowd. Many police officers accompanied the protest in Berlin, protecting its participants and blocking streets for traffic. Dozens of volunteers created a protection zone around Greta by pushing away reporters who might have harassed her otherwise. All in all, the event was organized well. It included some interesting music performances, but their duration was too long, especially later on at Brandenburg Gate. Many protesters left before Greta held her short speech because they ran out of time, patience or both. The first F4F protest in Berlin took place on January 18th. 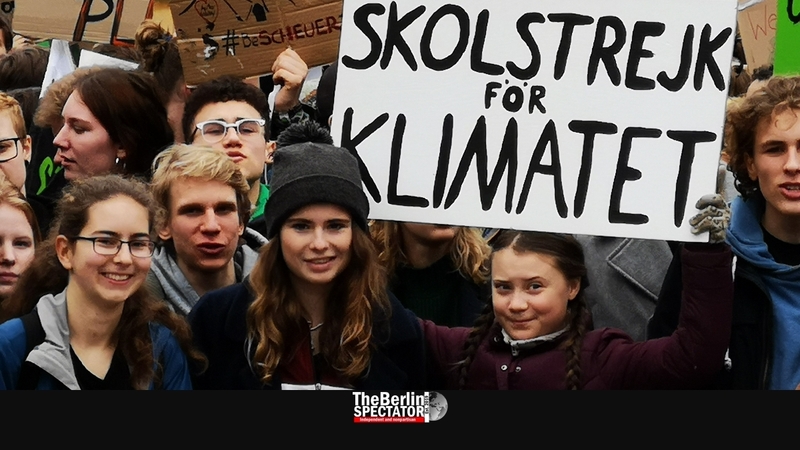 Since then, students have skipped school and invaded the streets every Friday, in order to raise awareness for the issues connected to global warming, as well as the need for immediate action. Greta Thunberg will be awarded with the ‘Goldene Kamera‘ (‘Golden Camera’) media prize in Berlin this weekend. The city state’s Governing Mayor Michael Müller said the Funke Media Group, the publishing house which gives out the prize, had shown it understood how young people thought nowadays.